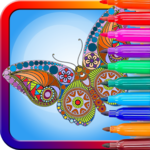 Adult Coloring Book Mandalas — Android App Listed on Flippa: Adult Coloring Book Mandalas Android App! Integrated With Admob Ads! Adult Coloring Book Mandalas Android App! Integrated With Admob Ads! **Adult Coloring Book Mandalas ** offers an abundance of coloring sheets with mandala drawings that will bring hours of relaxation and awake the inner artist in you!